• PLOT SUMMARY: Cover by ED MCGUINNESS. World War Hulks: Part 7 - "Dogs of War" Written by JEPH LOEB. Pencils by ED MCGUINNESS WORLD WAR HULKS BEGINS! The FALL is over. Long wage the WAR. Red Hulk and Banner have failed, and their worst nightmares have come to kill them. Will they die fighting M.O.D.O.K. and his army of Hulks, or die by the hands of the Hulked-Out Heroes? 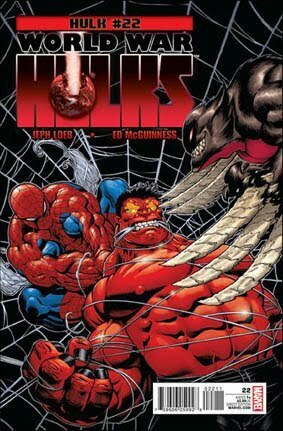 Jeph Loeb and Ed McGuinness begin the end in this first chapter of WORLD WAR HULKS. Plus: "Hulk Sleepover," a tale of the colorful Hulks by AUDREY LOEB and DARIO BRIZUELA.